Why join StarTiger? Because it's the best autograph community around - Period. Try us for free - you won't regret it. Easy to use, all in one place. 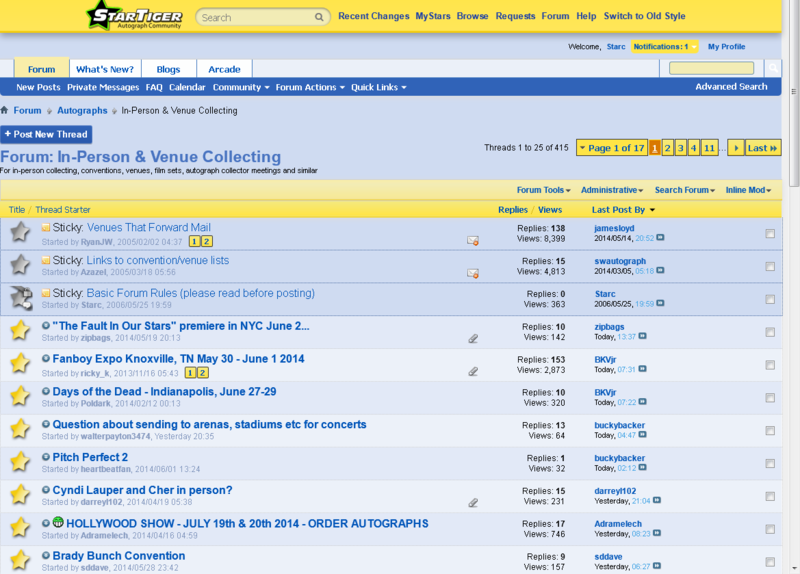 Find addresses, manage your collection, discuss with other collectors and much more! "I love how extensive and complete the listings are. I was also happy to find info on many stars that I've not had much success finding info on." 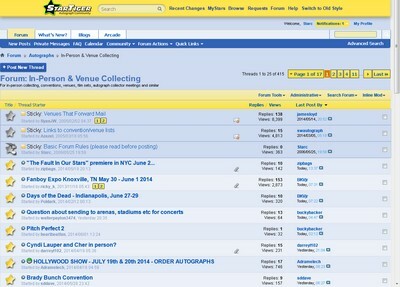 Manage your collection online - No more paperwork! Forget about the paperwork - Manage your collection with ease! When did I receive that autograph again? Which address did I use? When did I send it? With StarTiger you will always know exactly when, what and from where you received your response. 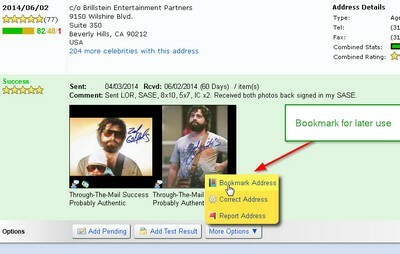 You can even attach scanned autographs directly to the response so you know which autographs you received from which response. And you can sort it - with a simple click - by name, status, date sent, date received, address or comment - Try that with your notes! ...and it's really easy, too! And when you receive back the response: A short comment, and the response is saved in your online records. "i just like how everything is so organized." Compare your results - Identify fake autographs. So you received an autograph through the mail - but is it authentic? Use our extensive autograph gallery of 810,000+ scans. 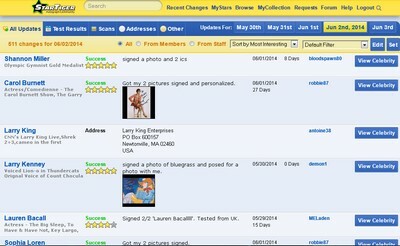 Compare what you receive with other autographs, including many, many in-person signed autographs. Each autograph includes its authenticity and how it was received (in-person, through-the-mail, pulled out of a card pack, etc.). The autograph gallery is a great tool to identify fake autographs you see for sale - e.g. on eBay. Don't spend money on a fake autograph by accident - simply compare it first! 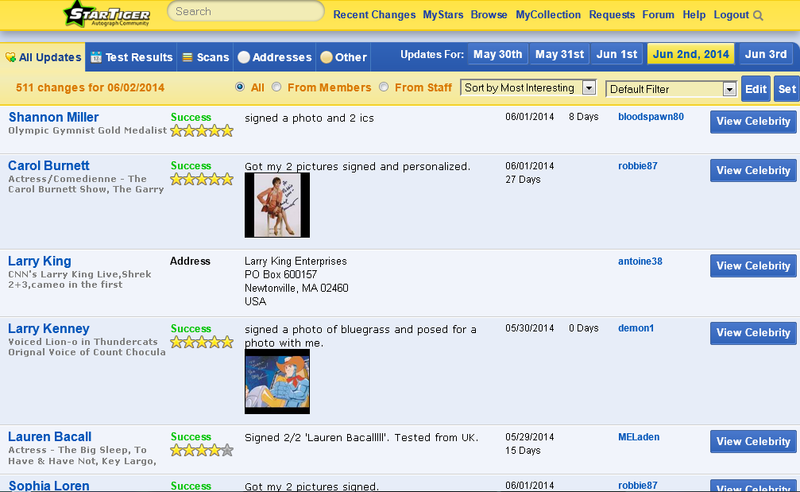 Plus: The scanned autographs also give you great information on what to expect when sending to a celebrity. MyCollection - Showcase Your Collection Online! Show all your friends your collection online! your website is automatically updated as well! "I like that I can send a link to anyone and they can see the items I am proud of." ...and always know what has been changed. and we perform hundreds of changes, additions and updates every day. This makes it easy for you to stay up-to-date. Plus: you can customize the list so you only see the updates you want to see. 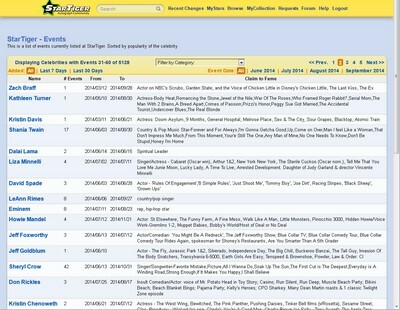 Always know exactly what has changed - Each celebrity features a summary of all changes made to the page. 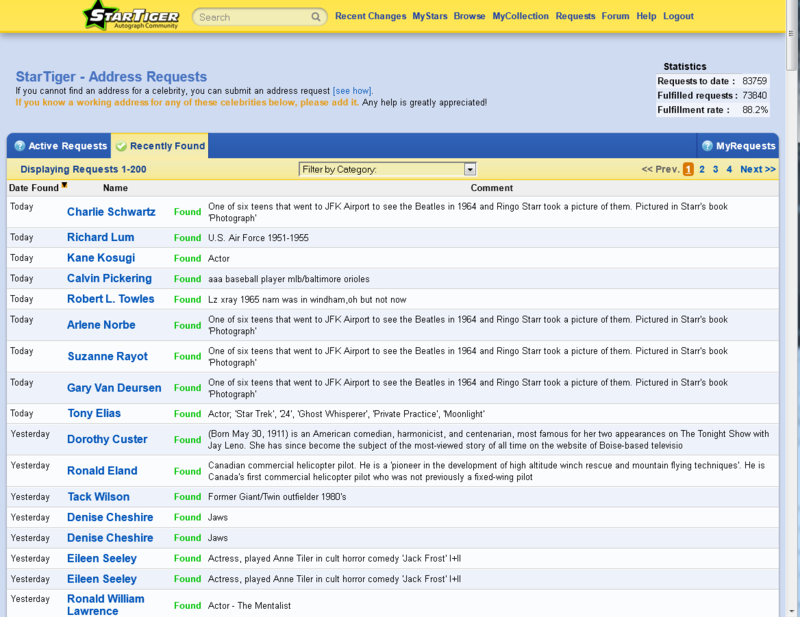 Compiling recent updates for your favorite celebrities, this section gives you a quick overview without searching. Know what to expect before you send. 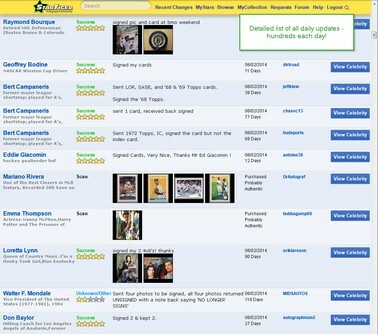 StarTiger provides you with extensive statistics about all addresses and celebrities. All agency, sports team, etc. addresses are cross-linked. See how good a specific agency or sports team is with forwarding fan mail and select the address that delivers the highest chance of a successful reply! 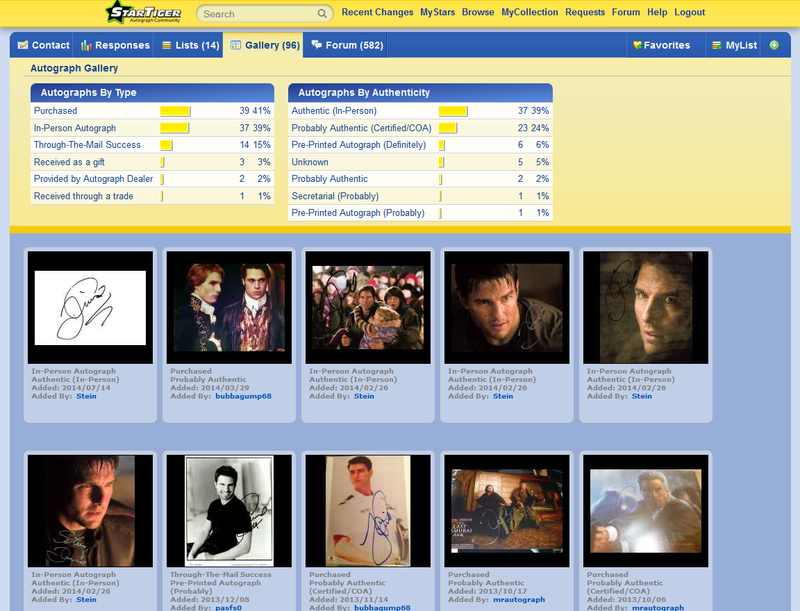 Detailed statistics about each celebrity show you how good a specific celebrity is with replying to fan mail. Make a better informed choice by knowing this beforehand. Identify and avoid "black hole addresses"
All is lost, nothing ever comes back. Our statistics allow you to spot, identify and avoid "black hole addresses". Discuss your successes with other users. Ask for advice, tips & tricks of experienced autograph collectors. With more than 70,000 topics, 1,000,000+ posts and hundreds of new posts every day, this is a treasure of information and joy for every fan and collector and the heart of our community. Have question about a specific submission or scan? Simply send a the user a direct message. 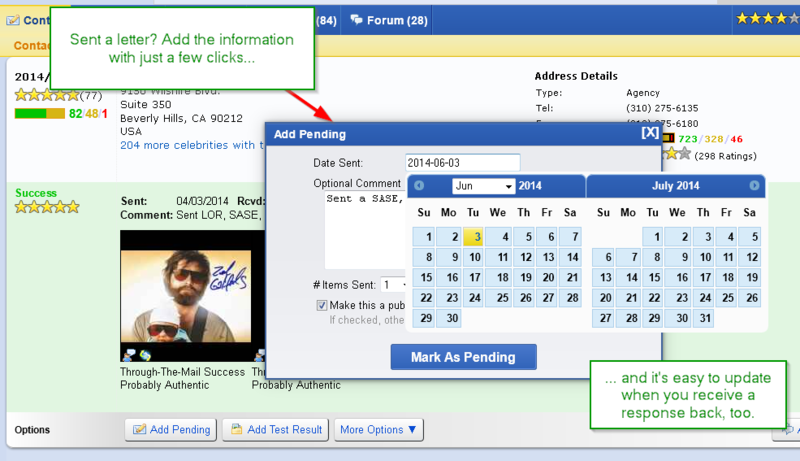 Request new/updated addresses with a few clicks. Cannot find an address? - Let us look for it! You've been looking for a working address for years? Your favorite celebrity is not listed yet? You believe the addresses listed are no longer accurate? Simply request a new or updated address with a few clicks. If you're looking for a hard-to-find celebrity, this is your chance! Join now to add yours! In addition to our research services your your request is also shown in our request area, where our experienced members will help you out. Get extensive, live statistics on your collection! Complete history graphs for all your submissions, both by year and by month. Updated automatically every time you submit a response! Get a fast overview on how many letters you sent out. 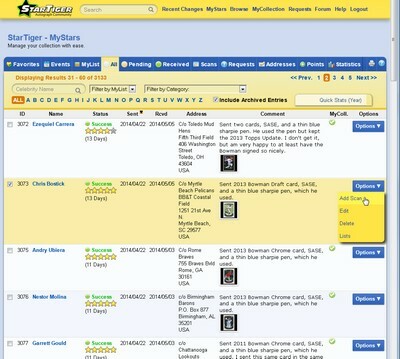 "I like that StarTiger is so easy to use and gives me a chance to organize my collection. Apart from that, I really like the statistics feature which has been a great improvement. Thanks very much!" 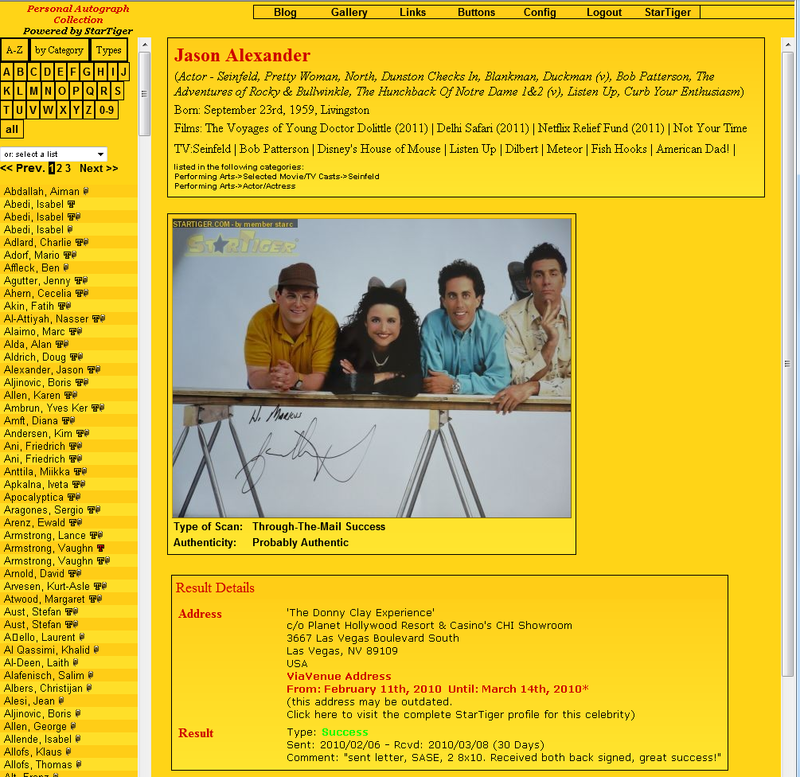 Events & Venues: Stay updated on where your favorite stars are. MyStars: Favorites - Keep Track on Your Favorite Stars! Keep track of your favorite stars! 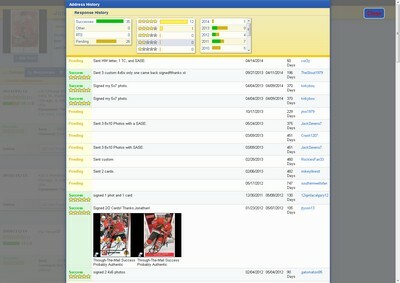 Keep track of your favorites with just a few clicks... never miss an update for them! 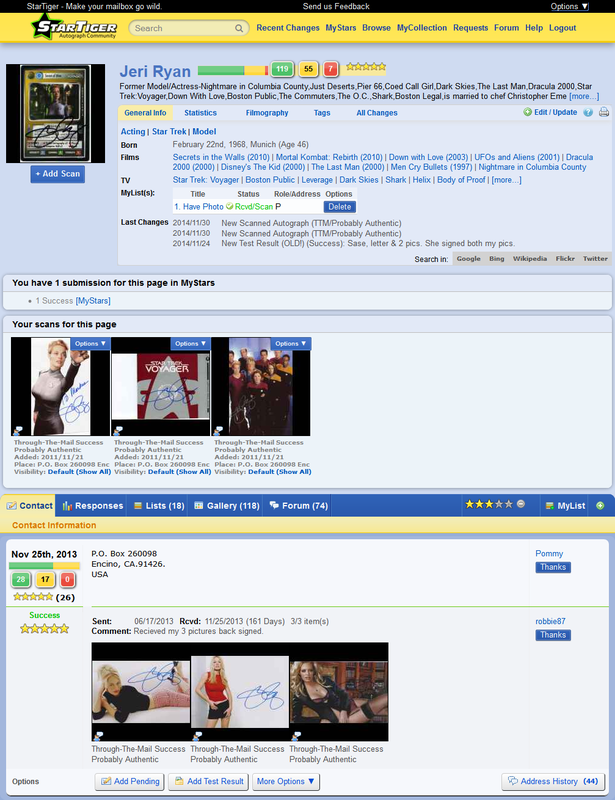 We will show you the most recent changes for your favorites - directly on your personal, customizable welcome page! 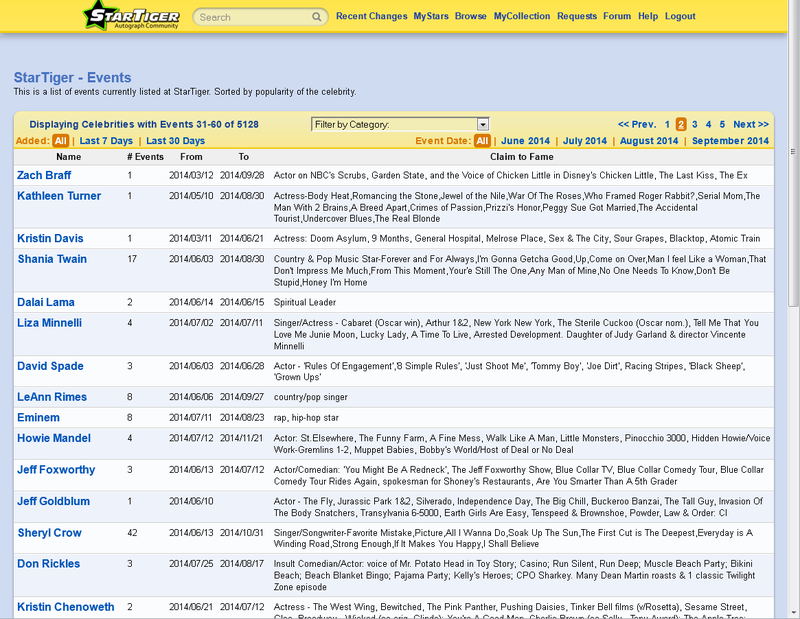 Use the "want factor" to use your favorites list as a wish list on who to write next! Your Satisfaction Guaranteed - Or Your Money Back! Joining StarTiger is completely risk-free and your satisfaction is guaranteed - or we will refund your money! 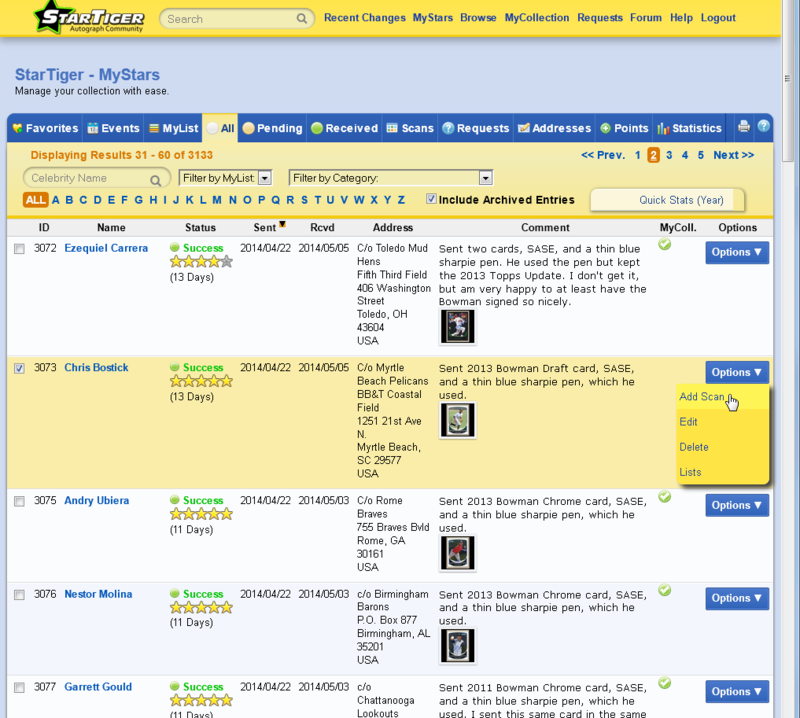 StarTiger is the World's Largest Autograph Community. We work hard on keeping our contact database up-to-date, with hundreds of changes per day. 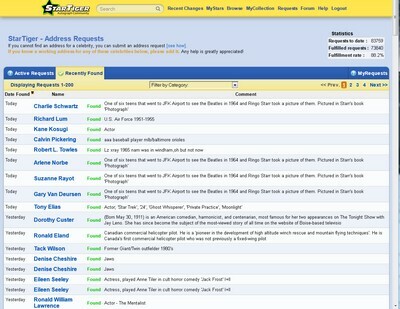 In addition to the feedback and submissions made by our members, we use unique techniques we developed for StarTiger over the years to provide you with address details for more than 440,000 celebrities, with constant updates. And we constantly work on our community to provide all our members with new or extended features, tools or even more information so they can concentrate on and enjoy their hobby. Should you be unsatisfied with StarTiger for any reason, just contact us (within 30 days of your payment*) and we will either solve the issue to your satisfaction or refund your subscription fee - whichever you prefer. Just join and try out StarTiger. We are sure that you will love our community. *Due to technical reasons we can only refund payments within 30 days after they took place - that is the only reason why we put the 30 days in there.